Tidal stream energy is more predictable and continuous than wind energy. It has the potential to provide 20 per cent of the UK’s electricity demand. Although the technology is still in its infancy, the UK has a head start over its international competitors in tidal and wave power, with seven of the world’s eight full-scale prototype devices installed in UK waters. It is known that flow passing Tidal Stream Turbines (TST) support structure combined with the rotation of the turbine rotors produces a turbulent downstream wake that can be sufficiently energetic to disturb the sediments on the sea bed on which the turbine is constructed and affect the sediment suspension. This may have significant impact on the sea floor topography and adverse consequences for the indigenous marine flora and fauna. Thus far, little is known about the nature of the turbulent wakes of the rotors and the mechanisms by which these wake flows perturb the sediments in water and on the seabed. 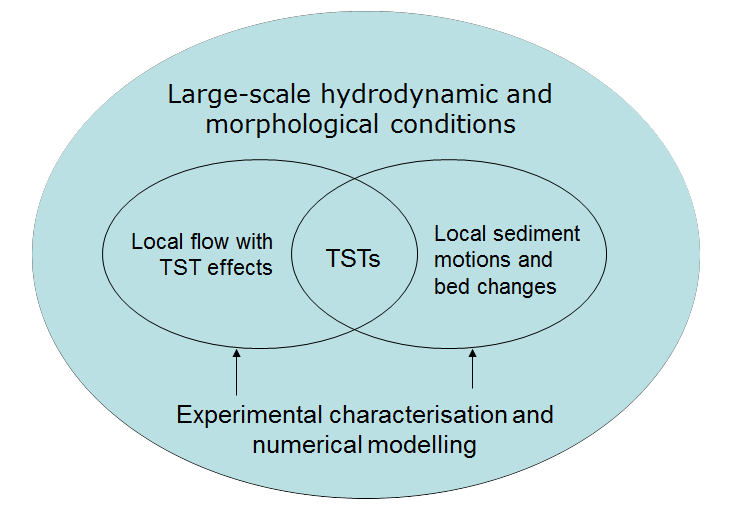 For cases in which several tidal stream turbines are constructed in an array, the configuration of the sea bed sediments is subjected to complex pressure distributions arising from each of the constituent installations and the prediction of sea floor sediment response is even more uncertain.